A full midweek dining room is a sight that makes me happy. Those who eat on school nights are committed gluttons, a different breed entirely to those that only go out on Friday and Saturday evenings. They know where the good stuff is at and they don’t want the hassle of waiting six weeks for it. They are the beating heart of the trade, the key to a sustainable business. If you can put bums on seats on a Tuesday and Wednesday night, you’ve succeeded. I doff my cap to you. We arrive on a Tuesday night when winter is flexing its muscle. It is dark, with wind and rain beating against the windows. On an evening when I really don’t want to leave the solace of my sofa, Fiesta Del Asado is full, turning away those who have chanced it without reservation. Those fools. What impresses most is this is not a location suited to passing trade; it is on a stretch of the Hagley Road where intermittent hotels are joined by a healthy prostitution trade, and, even worse, TGI Fridays. 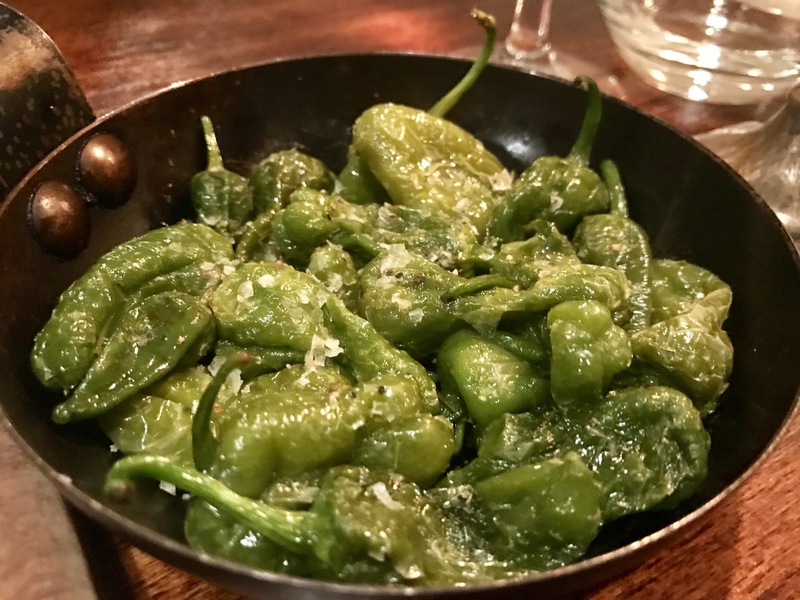 Eating at Fiesta Del Asado is a deliberate choice that evidently requires pre-planning whatever day of the week. It is a handsome dining room where large wooden tables are adorned with little but candles. 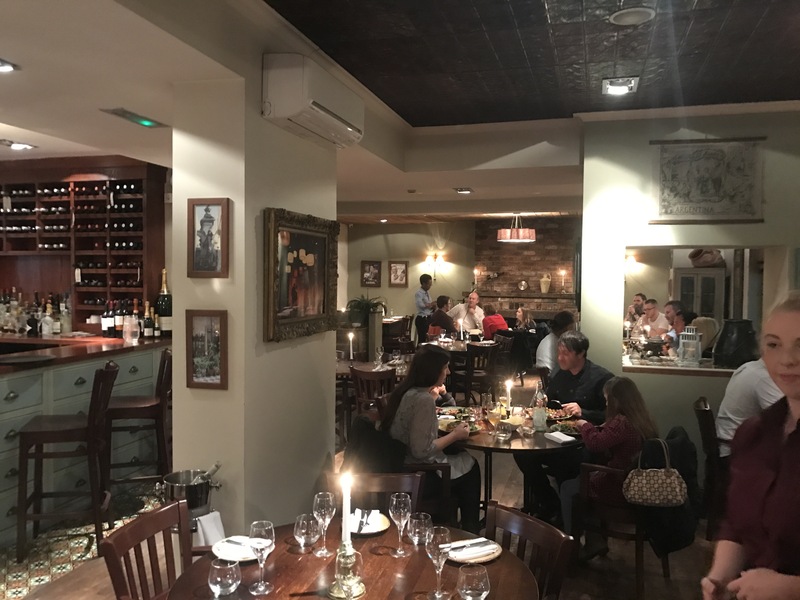 The restaurant focuses on the Asado style of Argentina with hunks of meat cooked over applewood on the grill that is central to the kitchen. 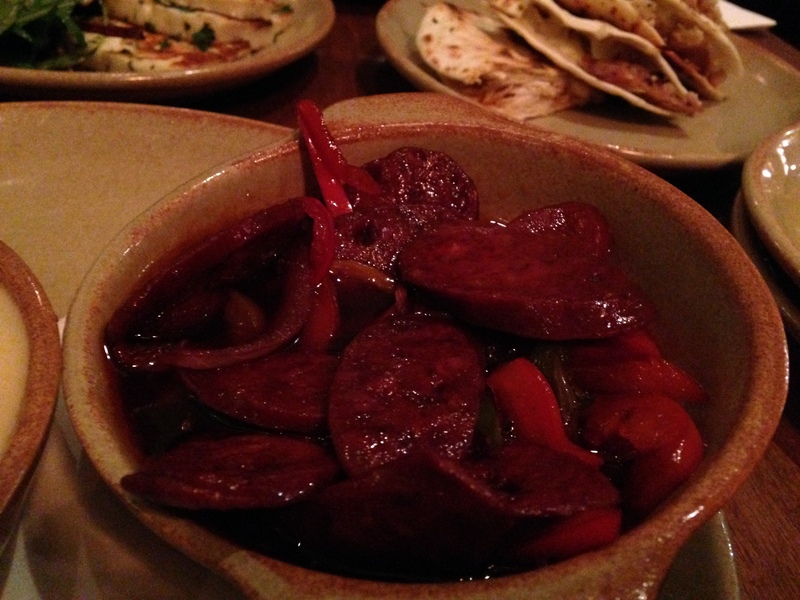 We start with small plates of padron peppers and sobrasada, a spreadable chorizo, with toast. Both revel in their simplicity, the best of ingredients worked as little as possible. 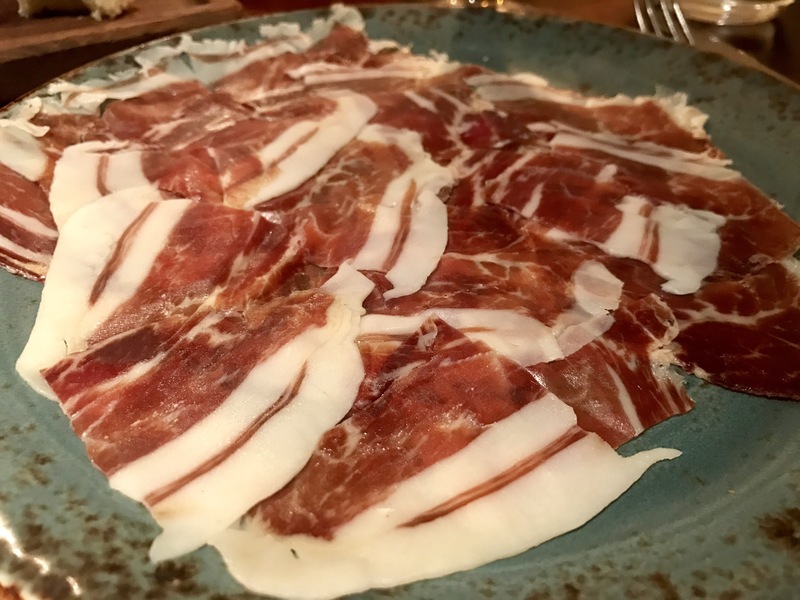 We move on to a plate of Iberico ham, with deep flavour and ribbons of soft fat that threaten to disintegrate from the body temperature of finger and thumb. They do other meats, but we only have eyes for the beef tonight, for which we take two very different preparations. Slow cooked brisket arrives in a thick red wine gravy, almost mulled star anise, cinnamon and clove. It is a classy bit of cooking, more so with the addition of fried potatoes and sweet corn that add body and texture. 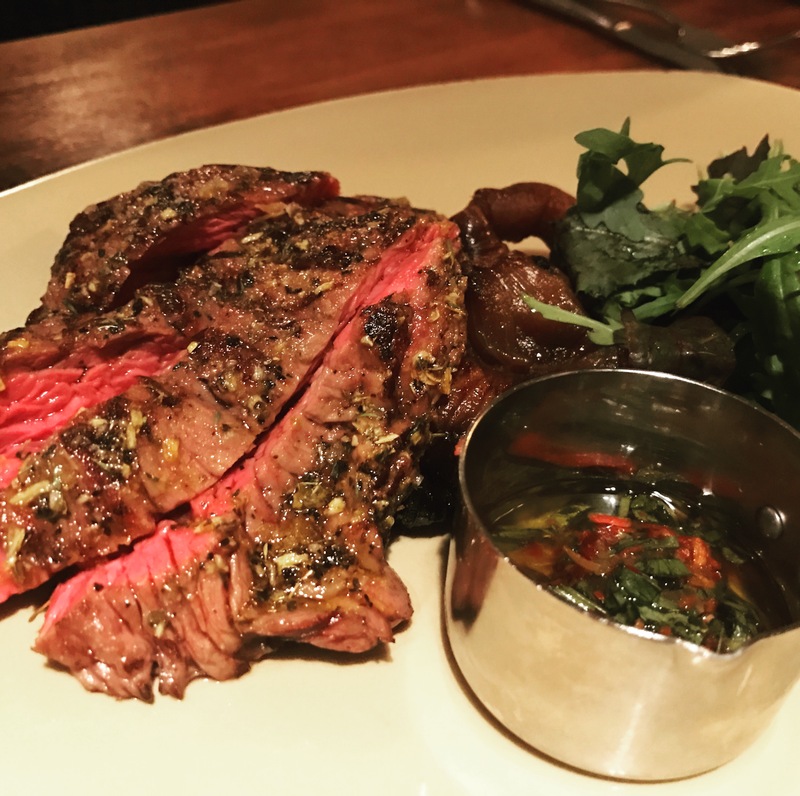 It is the bavette that shows off what they really do best here, fired aggressively over the grill so that the steak has a charred crust and the centre a perfect medium rare. All it needs is a lick of bright acidity from chimichurri and you have a complex bit of cow far more flavoursome than any bit of fillet. 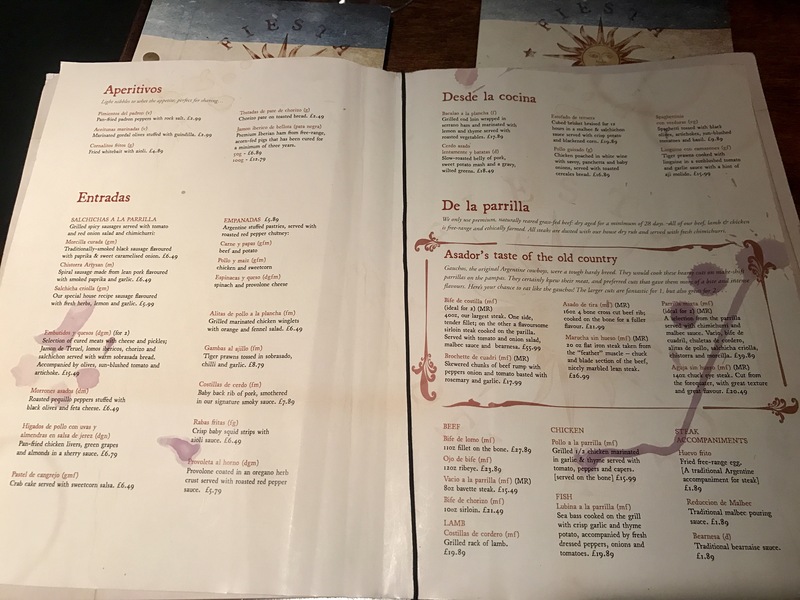 Not even the most charming of waitresses could tempt us into a dessert, leaving us to finish up on a very fairly priced Malbec and vacate our table to those still hoping to get a steak dinner tonight. This was my first trip to Fiesta del Asado in around three years and I’d honestly forgotten how good it is. It’s not cheap, but the steaks here are as good as any in the city. Don’t just take my word on that; there’s a dining room full of people who all share my opinion. Today it’s a whistle-stop visit at Cau, a new South American style steakhouse in Brindley Place. Inside the monochrome interior is broken up by lucid green wallpaper that echoes grass, whilst clouds dangle from the high ceiling. Its an odd space, seemingly kitsch and intent on dividing opinion. With little time to wonder around the menu, we plunge straight in to the beef for mains. The cow, or cau as they would have it, would prove to be very good, maybe even surprisingly so, full of deep bovine flavour from an animal properly sauced and hung. The sirloin appeared central to the plate with no accompaniments – a ballsy move that lives or dies on the quality and cooking of the meat. It was cooked rare as requested, and correctly rested so that the meat juices had remained where they should be and not on the plate. The seasoning was exact and the flavour of the cow good. It was hard not to be impressed and impossible not to love. On the side came chips the size of a fat mans thumb, which were crisp on the outside and fluffy in the middle. At fifteen quid it was a serious bargain. A burger also impressed. Stacked high, the patty came pink as requested, with an onion ring, American cheese and piquant ketchup. 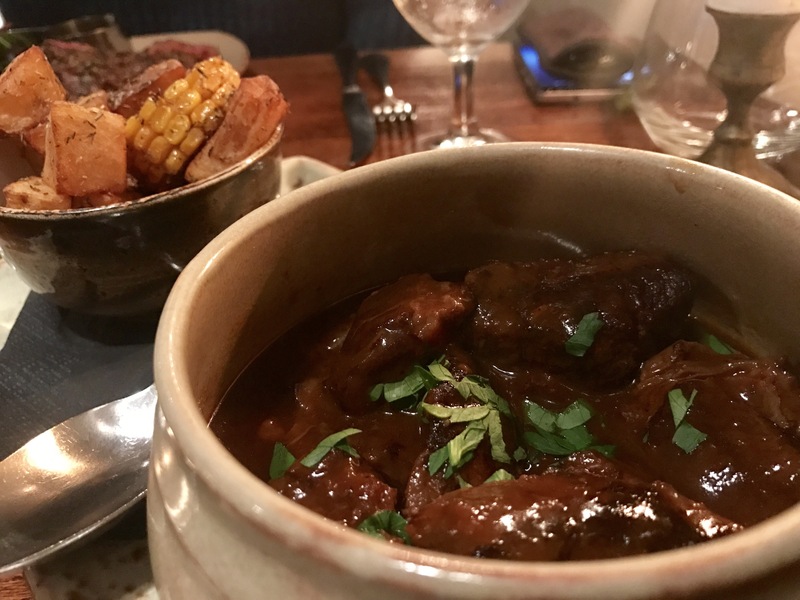 What made it was the addition of sticky bits of braised short rib, that reinforced the bovine flavour and added a subtle fattiness. It wasn’t easy to eat, but then the best things never are. More of those fat chips and another fifteen quid left us replete and pleased with the afternoons work. We never took desserts, though the website shows some interesting options. Perhaps next time, eh, when I can also explore a seemingly well crafted list of Malbecs. Cau impressed for having a product that far exceeds the mid price range it promotes. And they deliver via those efficient scooter boys over at Deliveroo, which makes that steak / burger dinner at home all the more luxurious. I normally insist on several dishes before I can give a score,though in this instance I can confidently say that if you’re looking for a lump of Cau, you’ve come to the right place. I have been going to Bodega long before I started this blog, which I suppose is a recommendation in itself. I can’t say it’s ever been my favourite place to eat, but my girlfriend clearly enjoys it, which leaves me with little choice. To me its unique to Birmingham, though only because the second city doesn’t have a Wahaca on every corner like London. 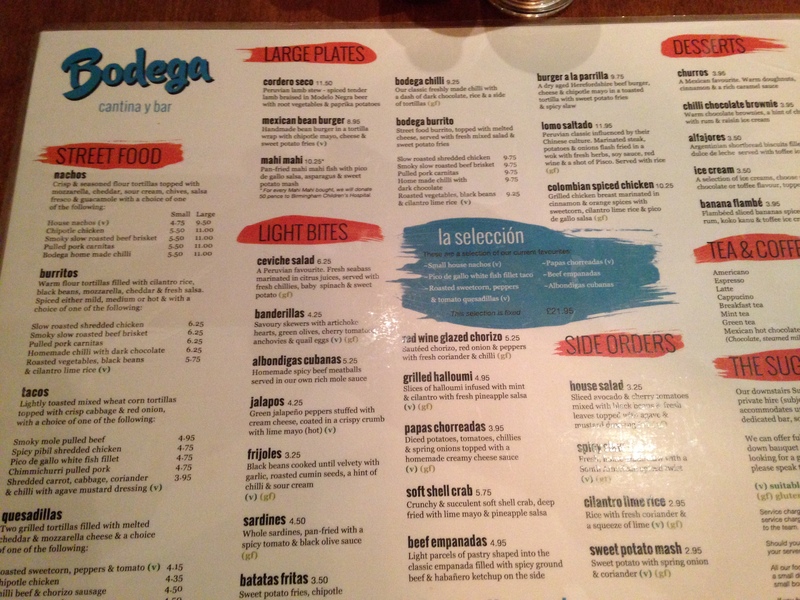 If Wahaca is specific to Mexico in its approach, Bodega takes a broader stroke to South America with familiar dishes like burritos along with the less common banderillas and cordero seco. And shame on you for skiving off Peruvian classes at school if you don’t know what cordero seco is. I leave the girlfriend at home and take a much more ear friendly approach with my friend. Even on a cold Tuesday evening the place is full and the service is warm. It has a casual feel, with colourfully decorated walls and low lighting. 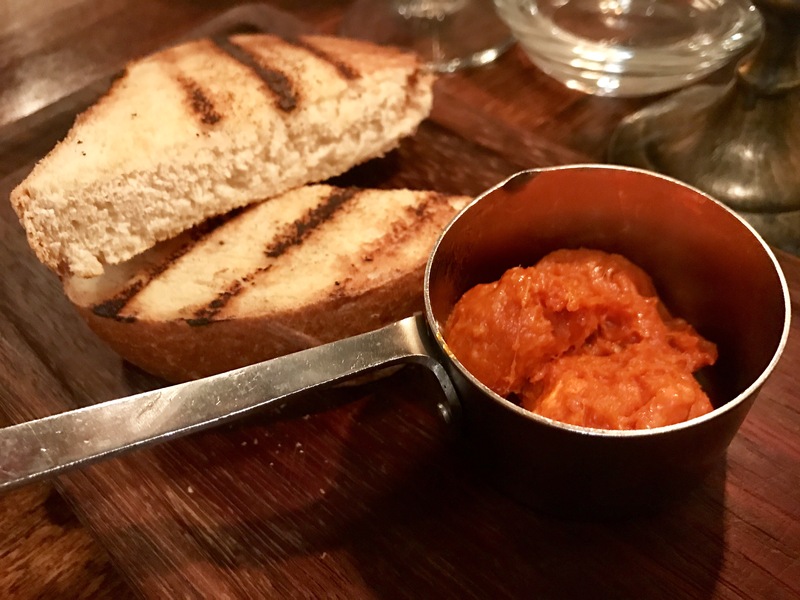 We settle on a selection of small plates with the intention of sharing – a notion that upsets me just thinking about it. 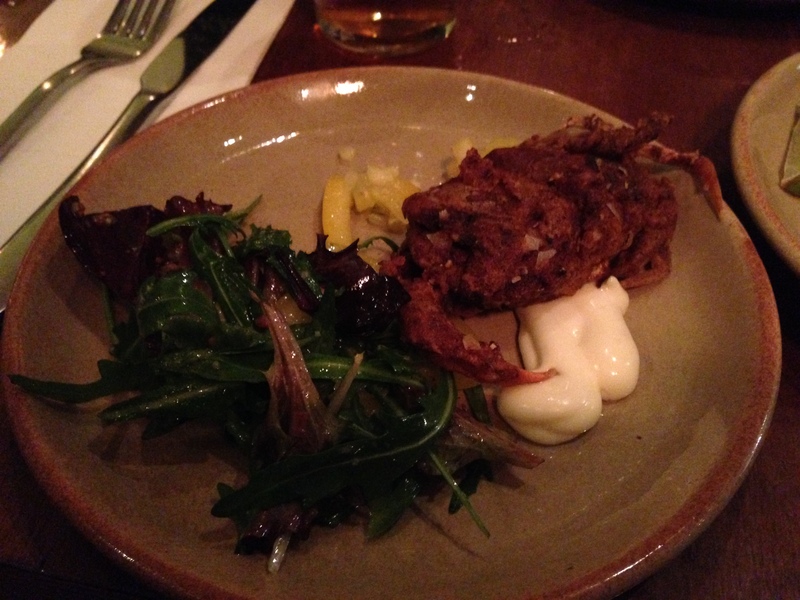 First up is probably the best dish of the night; a grease-less deep-fried soft shell crab, paired intelligently with a lime mayo and pineapple salsa that offer comfort and a little sharpness which both work well with the crustacean. 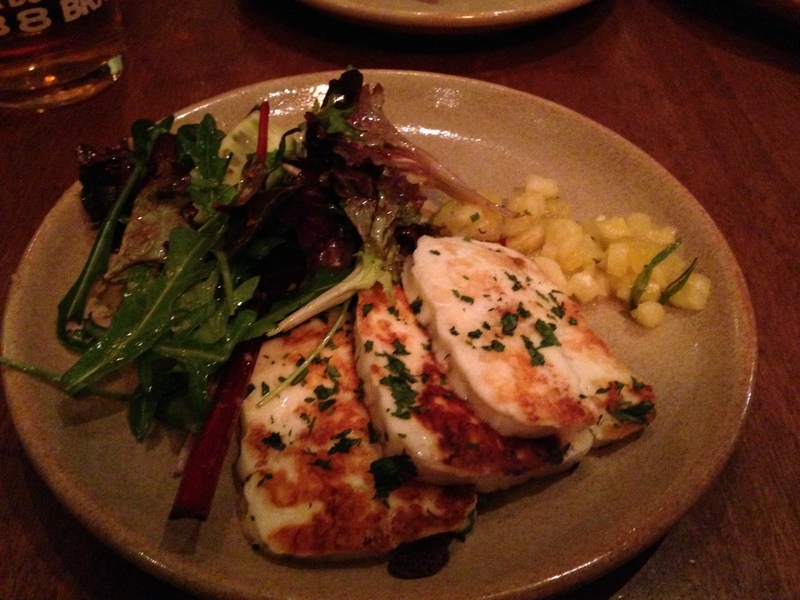 The pineapple salsa showed up again on a plate on halloumi, the cheese griddled carefully though not an obvious match to the salsa. 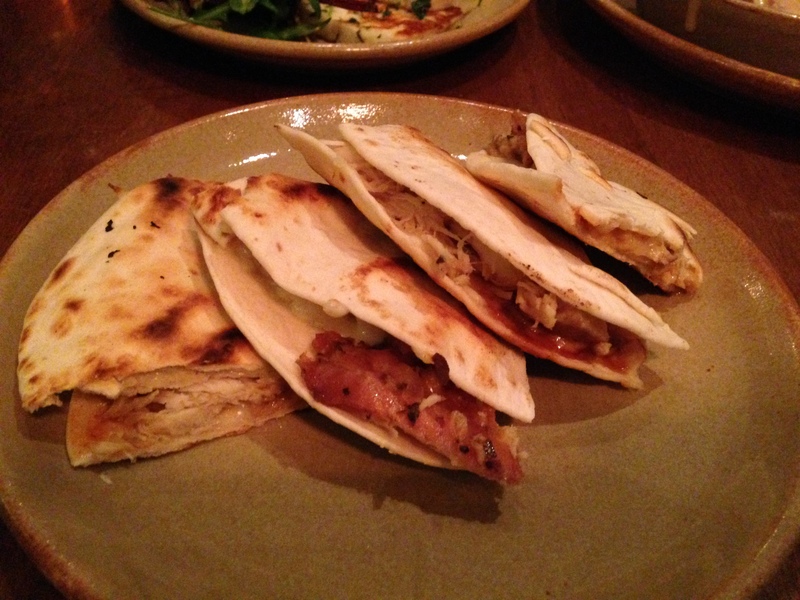 Chicken quesadillas is a dish I’ve eaten a million times. 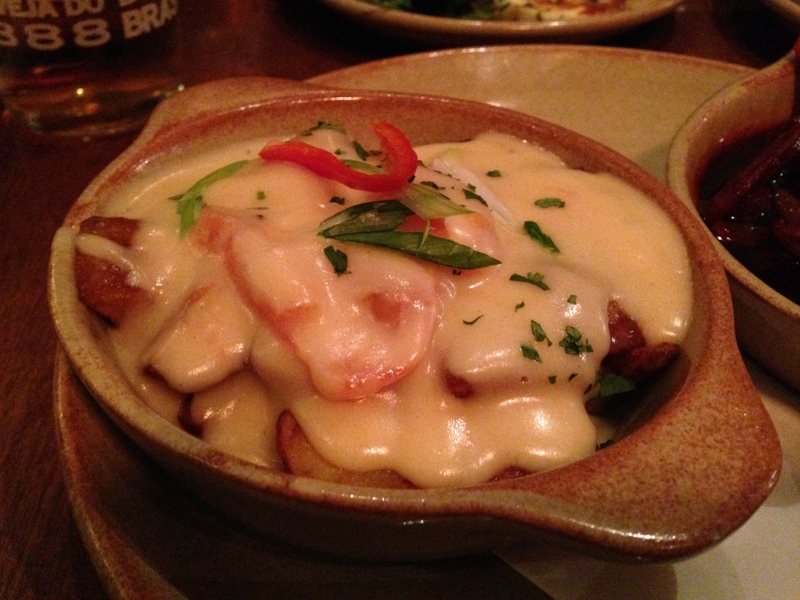 Here was a good example; large chunks of poultry flavoured with chipotle and comforted with melted cheese. 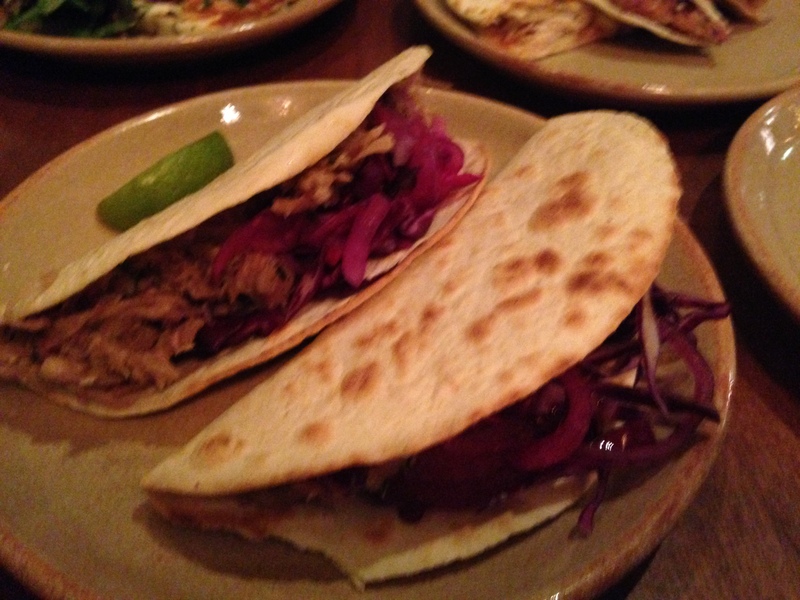 A similar success was had with the pulled pork tacos, which had good meat at its core and was accurately cooked. Much like everyone else in the country I’ve eaten a lot of pulled pork in the last twelve months – these taco’s will be remembered more fondly than the vast majority.